TroopWebHost welcomes your input! Our development priorities are driven by your enhancement requests. 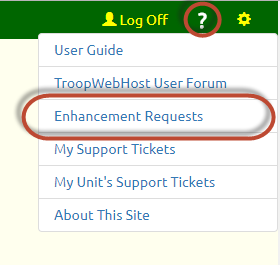 Select Enhancement Requests to view enhancements that have been requested by TroopWebHost users around the world, but not yet implemented. Use the Search button to narrow the list to a particular category, or to find enhancements where the description contains a particular key word, or to find enhancements you haven't yet voted on. Scroll down to see other users' thoughts on this enhancement. To vote, click one of the radio buttons indicating your preference. You may wish to add a comment indicating how your troop would benefit from this enhancement, or a suggestion as to how to improve the idea. You may also upload as many as three documents to provide supporting materials for this request. Please be aware that these documents and your comments will be visible to other TroopWebHost users. We only count one vote from each troop or crew, so voting multiple times will not improve the ranking of a request. 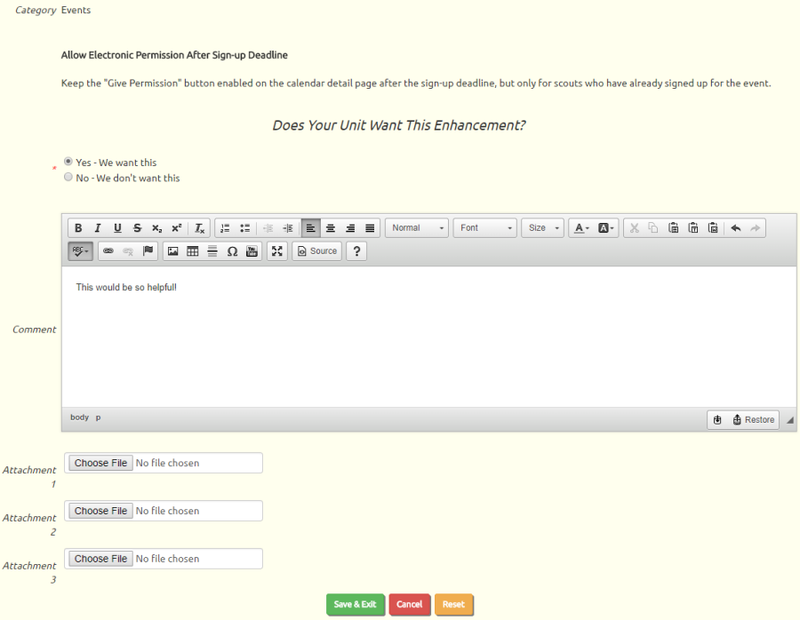 Back at the first page, click Add Enhancement Request to submit your idea on the form shown below. 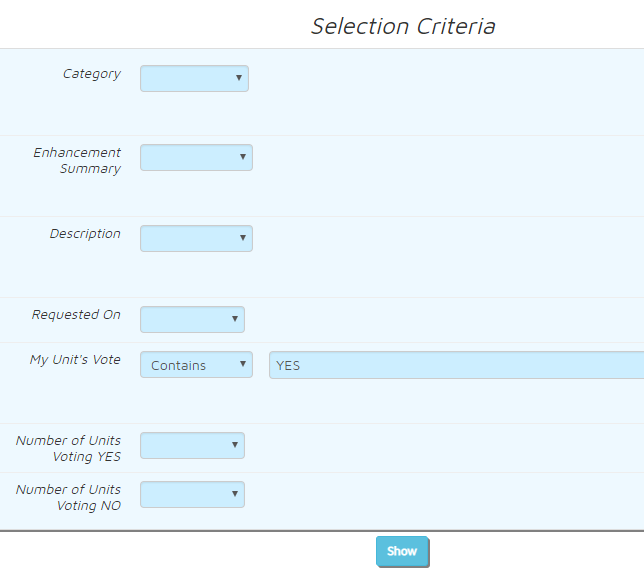 You must select a category from the drop down list, then enter a brief Request Summary that will appear as the title of your request. The Message should contain a detailed description of the request. Explain how the modification will work and why it would be beneficial to your unit. You may attach up to three documents providing background information. 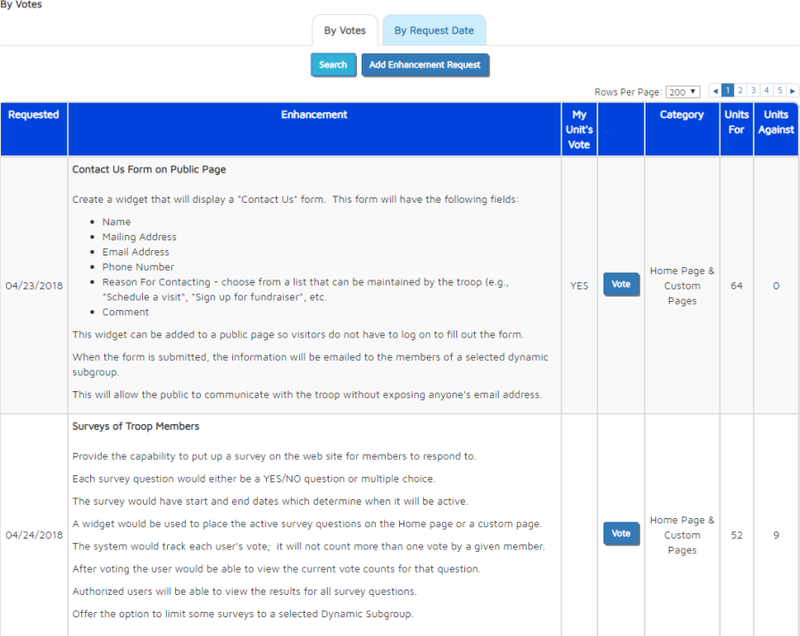 These documents and all of your comments will be visible to other TroopWebHost users. Click Save & Exit to submit your request. 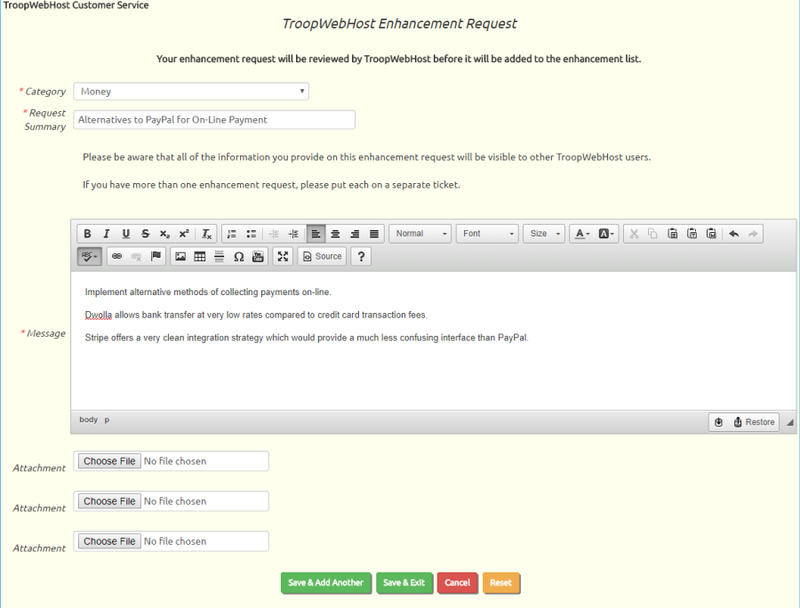 It will not appear on the list of enhancement requests until after it has been reviewed by TroopWebHost support. If a similar request is already in the system, your request may be attached as a YES vote to the earlier request. The Enhancement Requests page is available to any user with the Adult or Site Administrator user role. You can make it available to those with other user roles by authorizing those roles for the "TroopWebHost Support Ticket - Mine" task using Assign Tasks To Roles. When an enhancement request is completed, all users who requested that enhancement - or voted YES - will receive an email announcing the availability of this new feature.